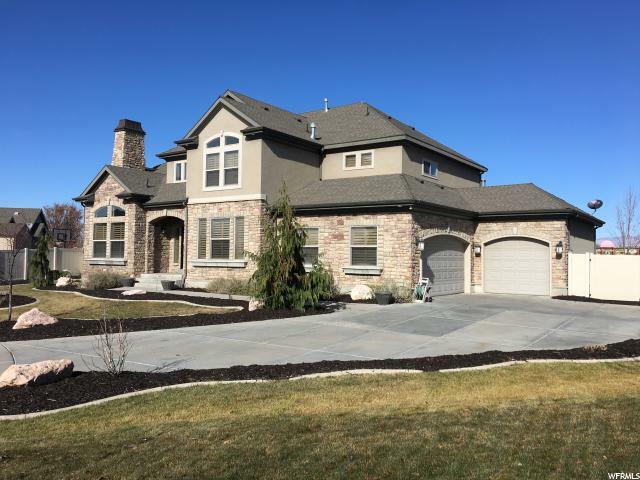 Stunning 2-Story 7 bed/3.5 bath home on quiet cul-de-sac inside Layton's highly desired Coldwater Creek neighborhood! This professionally designed and landscaped home has great street appeal boasting a stone/stucco front with 3 car garage. Enter an unbelievable entry with high ceilings, large living and dining rooms, fireplace and a staircase that is sure to impress. Soaring vaulted ceilings, high-end chandeliers and lighting throughout this home. Gorgeous gourmet kitchen with granite counter tops, recessed lighting, large Island with sink, pantry, top of the line cabinets, stainless steel appliances and tile flooring. Combined with the kitchen is a large breakfast and family room with fireplace creating the ultimate family gathering spot. The Upper level offers a master suite w/ attached master bathroom features: tall ceilings, tile, separate shower and jetted tub, plus a large walk-in closet with a laundry chute. Add three large bedrooms and full bath completing this level. Huge basement family room/game room with 9' tall ceilings, surround sound system wiring perfect for a theater room or entertaining friends. Other highlights to mention are a private study, laundry, high efficiency furnace & A/Cs, three gas fire places, exercise room, plus a plantation shutters! North facing fully fenced .46 acre sprinkled backyard with large patio and storage shed. Sub division features a nice community park, club house and pool. Convenient freeway access.